Inman Gallery is using a vacant space in their building (which I believe will become the Art Palace in 2010) to display some Dario Robleto installations. Robleto is both a highly intellectual artist but also an artist who creates visually stunning pieces. Many (if not all) of these pieces have been parts of museum exhibits in Seattle, San Diego and Boston--so I feel we are lucky that Inman was willing and able to exhibit them here. When you walk in, you see two large display cases, one white and one black. 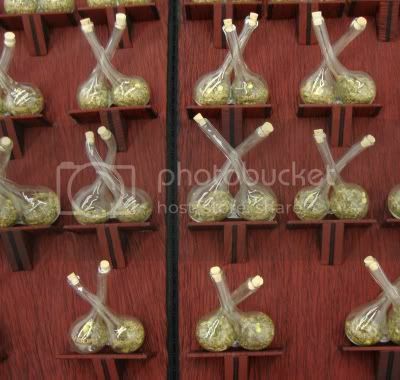 They look a lot like display cases used to show sports trophies or glass collectibles. The cases are about six feet high and nine feet wide, with several shelves that go along the length of the cabinets. The shelves are behind glass doors. On the shelves are small plaques propped up by small easels. Each one is fairly packed with type. The easels and plaques are white or black, matching their respective cases. The black case is called "The Boundary of Life is Quietly Crossed." Written on the plaques are AP newspaper articles recording the death of the oldest living human. The plaque on the upper left is the one who died most recently. Then subsequent plaques record the deaths of previous "oldest humans." The thing about being the oldest living person is that you aren't likely to hold this record very long. All of these people were over 100 years old, mostly over 110 years. Each article tells a little about the life of the person who has died, mentions who had been the oldest living person previously, and ends by reporting the identity of the new oldest living person. Then the plaque next to it is the previous oldest person. I usually don't like to read while I am looking at art in a gallery. I like presence, visual and otherwise. Making a viewer read is a serious imposition. A phrase here or there is ok. Text that is not meant to be read is acceptable (for example, Mark Tansey used distressed silk-screened type as texture in some of his paintings). So when I saw "The Boundary of Life is Quietly Crossed," I instantly went on to other pieces. I just didn't want to have to read those damn plaques. But eventually I felt I had to go back and see what was on them. And I sat their reading for quite a while--they were just so interesting, and the way they were arranged created compelling but random narrative (where each part of the narrative had only a coincidental connection with the previous part of the narrative). I don't know why, but reading so many of these articles at once made me feel more keenly aware of these people's long long lives than I would have if I had read one of these articles in the newspaper. The subjects of these plaques had lived through so much. Admittedly, these people are not historically significant. And as far as I can tell, their lives were not terribly eventful (eventful lives tend to be a lot shorter!). Individually, there is nothing special about these people except for their longevity. And yet, the black memorial case and presentation of the plaques is very moving. 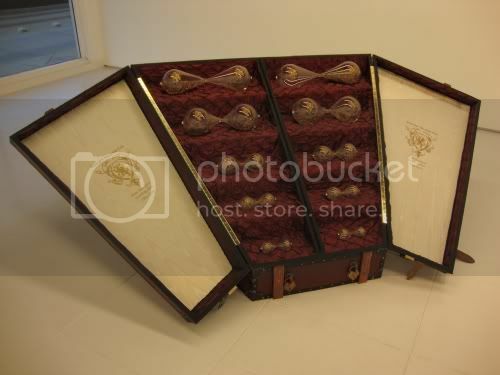 The white display case is "The Ark of Frailty," which is the counterpart to "The Boundary of Life is Quietly Crossed." Each of the plaques within reproduces a news story, as in the other piece. In this case, each plaque discusses a "Lazarus species," a species thought to be extinct until a new living specimen is sighted. It feels like a perfect mirror to the other case. Both of these cases include bizarre features that no viewer would be aware of without reading the little adjacent card that lists the materials used in making the pieces. For instance, Robleto often uses stretched and curled audiotape as part of the pieces. In "The Boundary of Life is Quietly Crossed," he includes locks of "hair" that are actually made of stretched, curled audiotapes of people speaking who are older than 110 years. Not that you can listen to them. Nor would you recognize them as audiotapes unless you read the informational card. Consequently, that little card is a part of the piece. If you see the piece without reading the card, your experience of the piece will be less complete. I'm not sure how I feel about this. It seems unnecessary to me, although it may have seemed important to Robleto to include these distressed bits of audiotape into the installations. Does he really care if we know what they are? I assume he does. 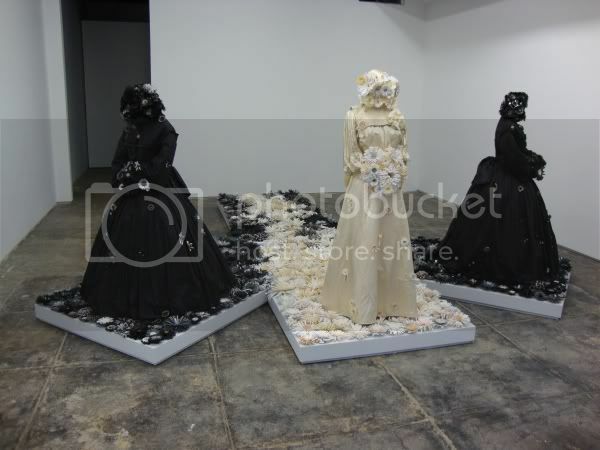 Again Robleto gives us black next to white, one wedding dress and two mourning dresses. They are "walking" on pathways made of paper flowers (and some of the paper is handmade of cotton rag and ground passion flower). I'm not sure how I should interpet the fact that their are two mourning dresses for one wedding dress. But like the other pieces, there is an air of the antique here (the wedding dress is from the 19th century). In the third room are two elaborate display cases. 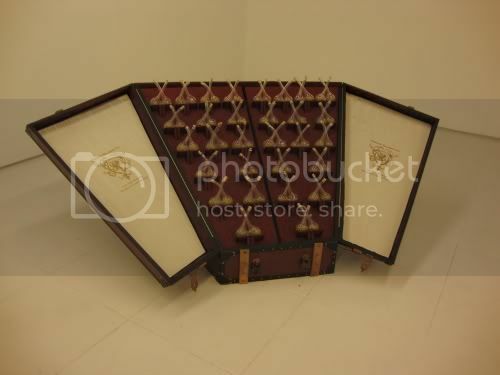 In some ways, the remind me of coffins, in other ways, the old sample cases that travelling salesmen carried. But they really are unique--designed tautologically to display the things that were designed to be displayed in them. 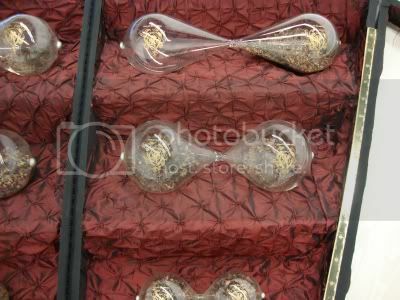 This piece displays 10 glass containers that look a bit like hourglasses laid sideways, but also look like infinity symbols. Each one is desgned to fit on the space in which it rests, so they are longer and more stretched out at top, and rather squat at the bottom. The stuff inside is leafy and frankly looks a little like marijuana (I'm assuming that is not intentional). The plant matter actually consists of ground resurrection plant, ground rosebuds and rosehips, and stretched and pulled audiotape (again!) of the voices of the world's oldest married couple and of an experimental clock from the 19th centrury. 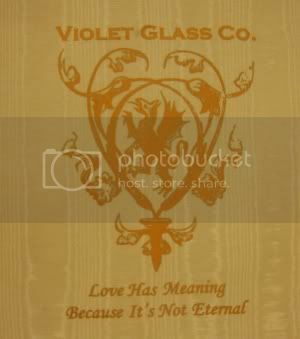 Its virtual twin (twinned installations seems like a theme of Robleto's) is "Love has Value Because It's Not Eternal." This piece also displays little glass bottles with plant matter inside. Again there are audiotapes--this time of glaciers melting (recorded in 2005-06) and of lovers recording each others heartbeats--pulled and stretched and mixed with plant matter--resurrection plant again, passion flower, "eternal flower" (whatever that is) and amber. Robleto really sweats the details. What is it all about? The mortality of humans and the immortality of nature, perhaps. But the experience of simply being in the same room as these mysterious, beautiful objects is meaning enough for me.